You can believe his often-spun story about having a parasitic twin cut from his stomach or not (I don’t), but there’s no denying Mysterion is one natural-born freak. Long before he concocted his popular psychic-entertainer act and declared himself a “Ph.D. in E.S.P.,” Mysterion was the kind of boy for whom every day was Halloween. Today, he puts his eccentricities to work as a performer. From his home base in Parkdale, he haunts the West Queen Street West strip, booking himself into pubs and clubs, where he does magic tricks and paranormal treats as part of an olde tyme sideshow. You don’t even need to pay to catch his act, as he’s often found delighting strangers on the street with sleights of hand, or giving them a good unanticipated spook from behind. Somehow, Mysterion has managed to make a pretty good living out of being a weirdo. To religious scholars, “mysterion” is a Greek word referring to something that is beyond the normal apprehension of mortals. 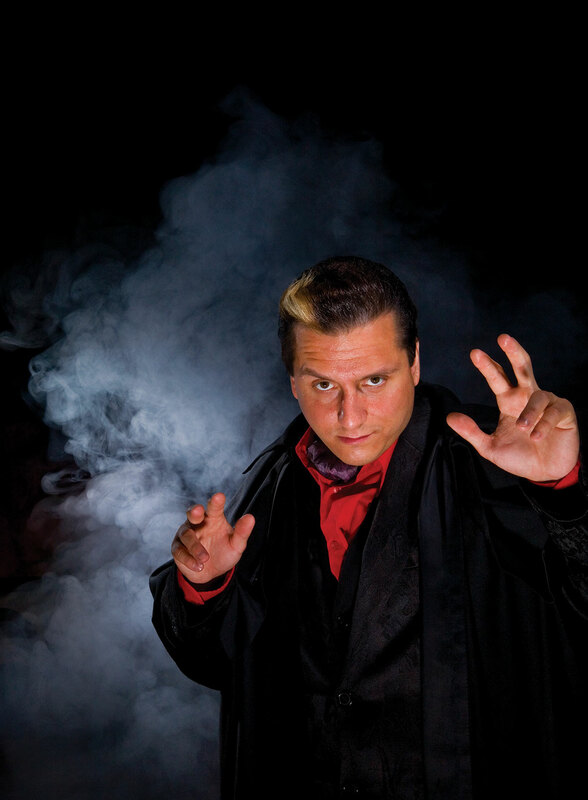 But our man the mentalist says his stage moniker is more inspired by Spider-Man’s comic-book foe Mysterio, a master illusionist and special-effects wizard. One might suspect it’s also a nod to the Mexican wrestler Rey Misterio, since Mysterion’s a big wrest-ling fan. It could be a derivation of all three. Like the Marvel comics universe, Mysterion’s mythology is being constantly written and rewritten to suit his ever-changing audience. After several years of shadowing him, I’ve learned enough to know his birth certificate doesn’t actually say “Dr. Maximilian Mysterion.” But grilling him about his offstage life still feels tricky, like trying to build a house of cards. And so we’ll just have to wade carefully through this tale together, like skeptics in a carnival funhouse, for there is both amazement and truth to be found here, inside the weird world of Mysterion the Mind Reader. But not everything is child’s play here. Seconds after our game ends, Mysterion is whipping up gourmet grilled sandwiches and jockeying calls from agents looking to book him for everything from bar mitzvahs to burlesque shows to banking luncheons (his high profile clients include C.I.B.C. and Indigo Books and Music). If corporate gigs seem at odds with his Queen Street scenester image, they’re not. Mysterion revels in his ability to straddle art and commerce—he is both the freak show and the carnival barker. Mysterion’s attitude explains why he is so easily recognized, even by those with no interest in magic. From Breakfast Television to Kenny vs. Spenny, there’s no camera he’s ashamed to mug for. He’ll start a sleight-of-hand routine on the streetcar. Bend spoons during dinner parties. Read your mind without warning while you’re waiting for a drink at the bar, particularly in Parkdale, where a night out without running into the guy with the white streak in his pompadour and a trick up his shirt sleeve is an increasingly rare experience. This desire—nay, compulsion—to cause a scene appears to be an inherent impulse, a switch that never turns off. Born north of Toronto, in the former city of North York, thirty-four years ago this October 31st (so he claims), Mysterion was raised in government housing by his single mother and grandmother. His mom, Maggie, a God-fearing Irish lass, still lives in the same neighbourhood, often venturing downtown to watch her son pave his way to hell hosting devilish burlesque shows or summoning dark powers to read strangers’ minds. One night at Clinton’s Tavern, I watched Mysterion subject the feisty brunette to a very up-close-and-personal striptease. But while Maggie put on an air of shock, it was obvious she was part of the act. The origin of his morbid sense of humour is more of a mystery. As a youngster, Mysterion would feed cookies baked with laxatives to his classmates. He also once locked his younger cousin in a broom closet with a plastic skull, delighting in his frightened cries and screams. As an adult, the prankster found a new kind of kick when he moved to Toronto’s Kensington Market, in 1996. He joined an Oi! band, the Blatherskites (memorialized on the out-of-print compilation Brewed in Canada), and took up amateur wrestling under the moniker the Blue Angel. But it was while working in the kitchen of the Parkdale rockabilly bar the Cadillac Lounge, in 2002, that he renewed his love of freaking people out with magic and the Mysterion character was born. That spooky something grew from a few arcane artifacts and mentalist feats to a full-blown production when Mysterion started inviting other weirdos into the act, many of whom still perform with him today. There’s his sidekick, the Wolfman, who writes much of Mysterion’s onstage shtick. Various girlfriends have been featured, from bodacious burlesquers to bloody human pincushions. Kindred spirits the Blue Demons often perform as his house band. The show is a combination of low-rent cabaret, Victorian parlour, and punk-rock house party. And while some of his mental tricks are truly amazing—he never calls himself a psychic, but his ability to probe thoughts is unsettling—his “sleights of mind” almost take a back seat to simply creating an environment where bizarre characters abound and anything can happen. His other rule is “always dress better than your audience,” which he does—usually in vintage suits and ties, although lately he’s also taken to wearing mismatched shoes. But for all his ambition and hustle, Mysterion doesn’t dream of Vegas or Broadway lights, which is probably wise. While his profile grew somewhat in tandem with magicians such as David Blaine and Criss Angel, Mysterion doesn’t share his big-name counterparts’ commercial flair. Look past his psychobilly scenester appearance, the tattoos and the slicked-back hair, the creeper shoes and the retro style, and you’ll see a short man who walks with an unusual gait, a kink in his neck. The flip side to his gregarious, unreserved persona is the penchant for taking things too far for polite company. He is a misfit among misfits. As such, he feels more connected to other oddball club performers here at home, from his competitors in Carnival Diablo to his peeler pals in Skin Tight Outta Sight. (He helped the latter spearhead the first Toronto Burlesque Festival this July.) Mysterion also hates to fly, so he sticks around town, attending the occasional magic meeting—it’s true, Toronto has secret magician meet-ups!—content to be part of the city’s own particular cast of creeps. There’s another element at work here, something out of his control. Even in creative circles, magicians rank somewhere below poets on the list of performers most people could do without. Mysterion is keenly conscious of his place on the entertainment fringe, but gladly rises to the challenge. A typical Mysterion performance involves comedy and costuming, acting and physical stunts, improvisation within a compelling narrative, and a show-stopping finale—often at pay-what-you-can prices. Mysterion is currently in the process of adapting once again. Aside from working on a TV pilot and assuming the management duties of the local stranglehold wrestler the Kentucky Butcher, he has spent much of 2008 in semi-seclusion, redeveloping his act. He knows people have seen it all before, that he needs to suspend their disbelief once again. The sideshow displays are slowly being phased out, and he has recently introduced an extra-spooky gallows routine that he claims puts his very life in danger. Mysterion has performed feats like this before, but smaller ones that only risked damaging his hands. This time, he’ll be slipping a noose over his head—chosen by an audience member from a row of four neck-snapping real ones and one fake—and hoping his powers of persuasion and mind-reading hold (him) up. He’s even offering ten thousand dollars to anyone who can prove the real nooses are fakes. Mysterion hopes his dedication to his craft will eventually lead to what he wants most—to dwell amongst ghosts and ghouls all the time, to combine his passions for collecting terrifying trinkets, documenting historical horrors, and performing spook shows into an all-inclusive environment where he can live out his nightmares and invite others to share in supernatural mysteries year round. He continues to collect his taxidermied creatures, specimens in jars, and historical artifacts. He has just purchased a set of waxed heads—an African man and woman—from Madame Tussauds, and spent a good twenty minutes of my visit browsing for haunted human skulls on-line. Liisa Ladouceur is a poet, arts reporter, and real live goth living in Parkdale who likes arcane words and dead things. Her dream date is Jack Skellington. Last updated Halloween, 2008.